Two weeks ago I made a cheesecake for a friend’s birthday party. 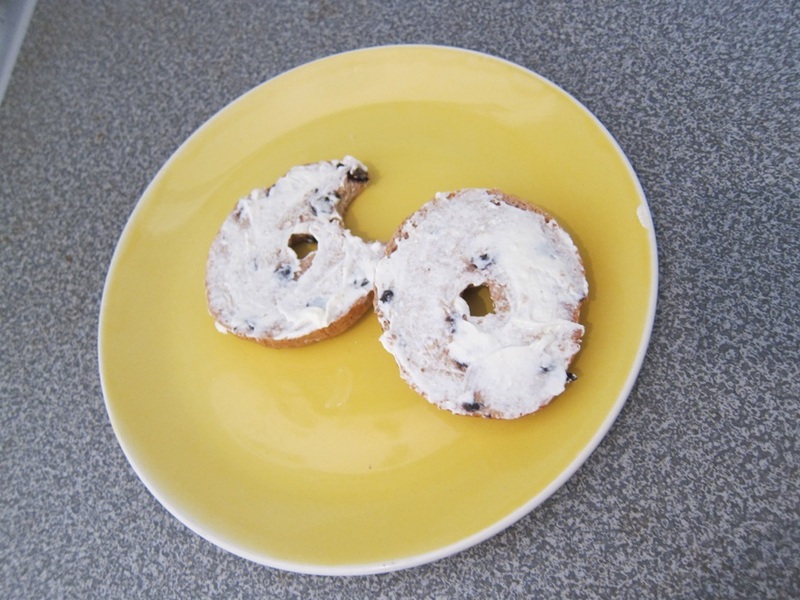 I had some cream cheese leftover, so kept my eye out for bagels in the supermarkets and bakeries around town, but never came across any. 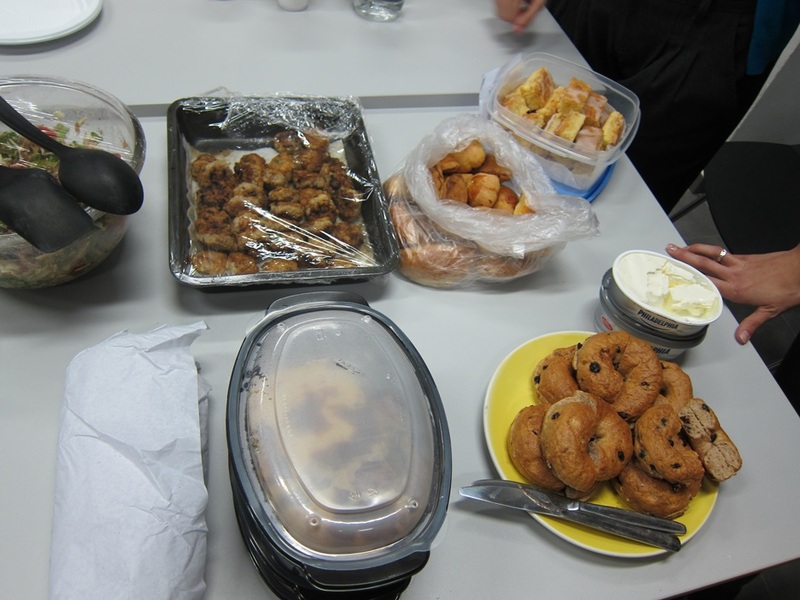 This week my internet friend and postal hero Craig gave me a bagel recipe, and we were having another ‘international food fest’ type dealie at school, making it clear what had to be done. The one time before this I had made bagels it was a terrible process, with dough that didn’t want to knead and multiple refrigeration periods, and I planned to never make bagels again. 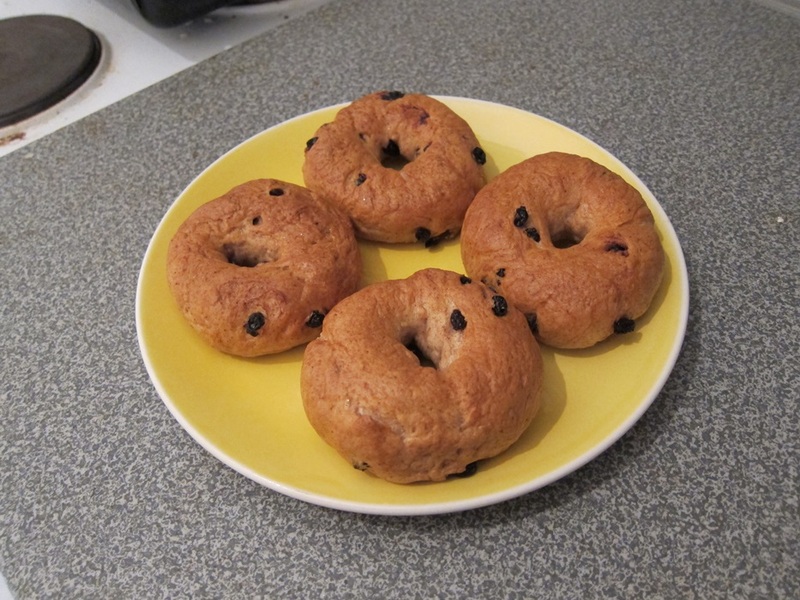 I really don’t know what the point of that recipe was, because this one was quite simple, and made bagels that taste and feel just like bagels should, so… bagels are back on the menu! Warm the milk and stir in the yeast. Set aside long enough to stir together the flour, sugar, salt, and any spices such as cinnamon in a large bowl. 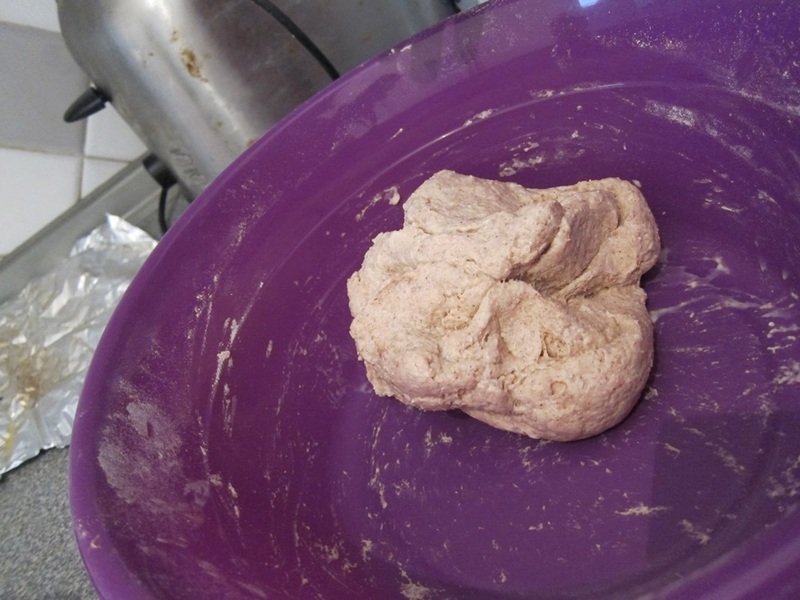 Pour the milk into the flour mixture and stir until the dough roughly holds together, then knead until smooth. 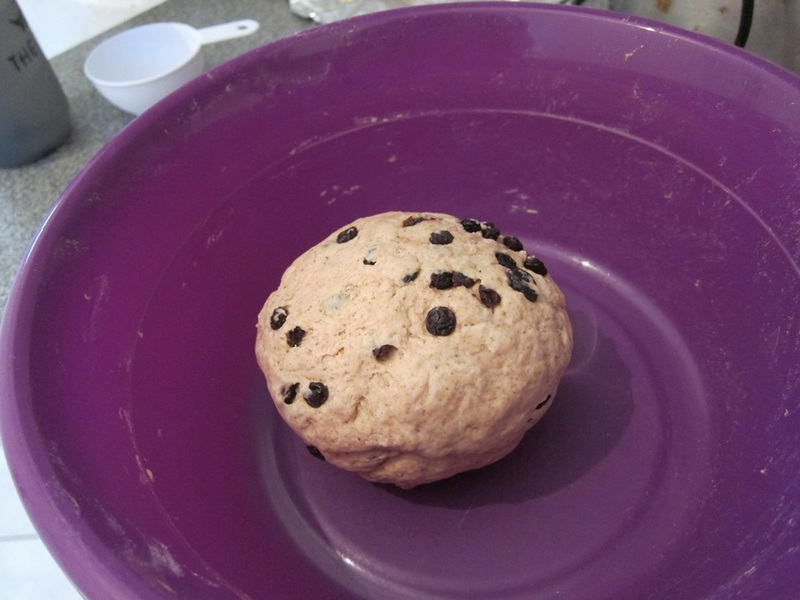 If adding chunkier add-ins, like raisins, add them about halfway through kneading, and keep kneading until they are all worked into the dough and evenly distributed throughout it. Yes, I do my kneading in a bowl lately, have you seen our counters?? Cover the dough and let it rise somewhere warm for 20 minutes. 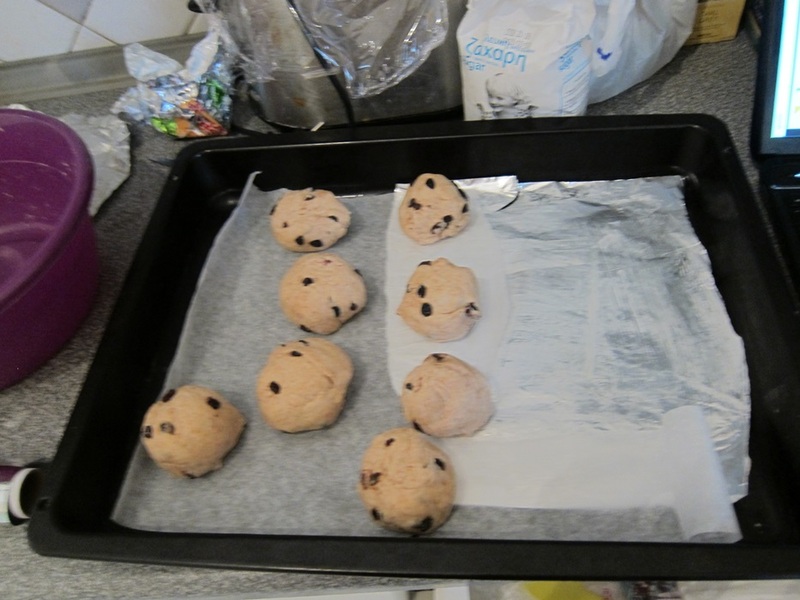 Divide the dough into 8-10 balls. Ran out of parchment, but I don’t think you even need it, these didn’t stick at all. Starting by working your thumb through the balls, one at a time, form them into a bagel shape. Try to keep them evenly thick all the way around, so that they cook evenly. Place them on a baking sheet. Brush the tops with oil, cover, and let rise another 30 minutes. Towards the end of that time, get a large pot of water boiling and preheat your oven to 200c (390f). Add 1 tablespoon of sugar for each liter of water in your pot. I don’t have a giant pot, so was using two tiny ones, and didn’t really bother measuring the amount of sugar. Not a big deal. Place as many bagels in the water as can fit without touching, and boil them for about 1 minute per side. 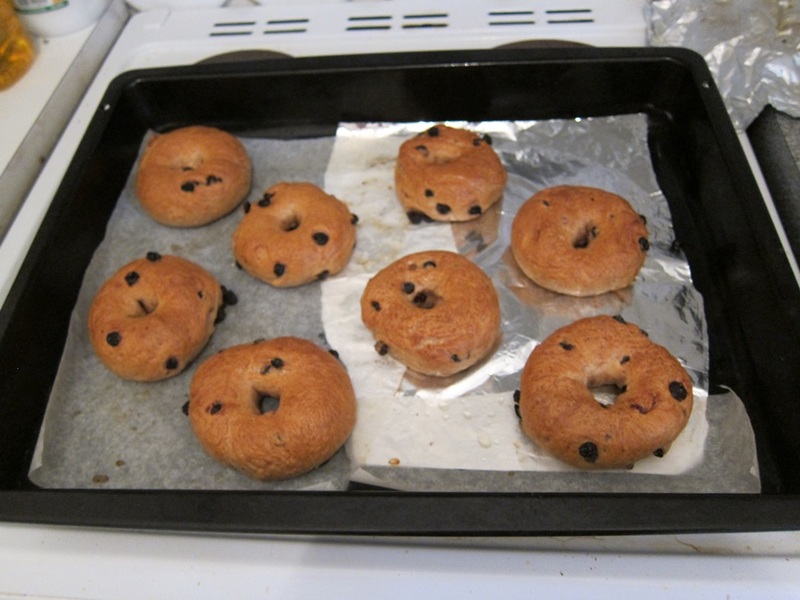 Place the boiled bagels back on your baking sheet, and boil the remaining bagels. The bottom ones have been boiled, you can see they get bigger during. Bake 25-30 minutes, get your self some cream cheese, and go to town! Warm the milk and stir in the yeast. Stir together the flour, sugar, salt, and any spices in a large bowl. Pour the milk into the flour mixture and stir until the dough roughly holds together, then knead until smooth. 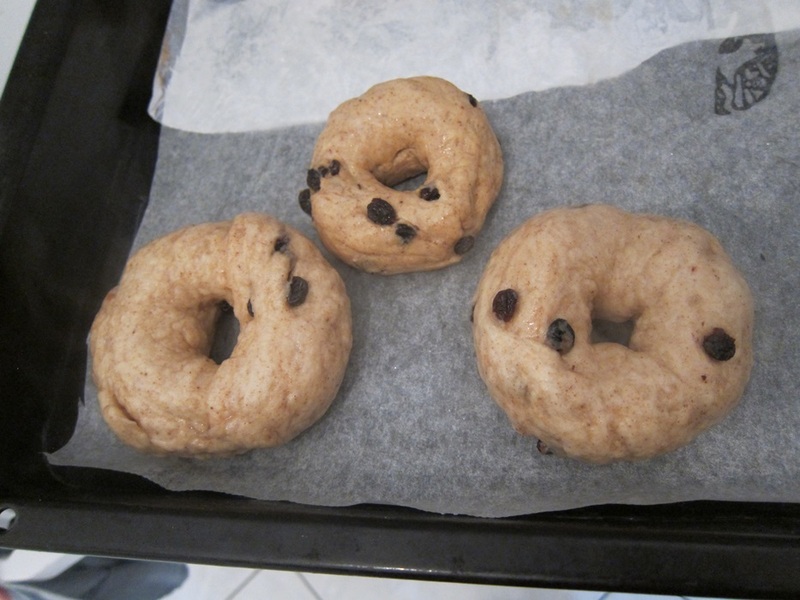 If adding chunkier add-ins, like raisins, add them about halfway through kneading, and keep kneading until they are all worked into the dough and evenly distributed throughout it. Cover the dough and let it rise somewhere warm for 20 minutes. Divide the dough into 8-10 balls. 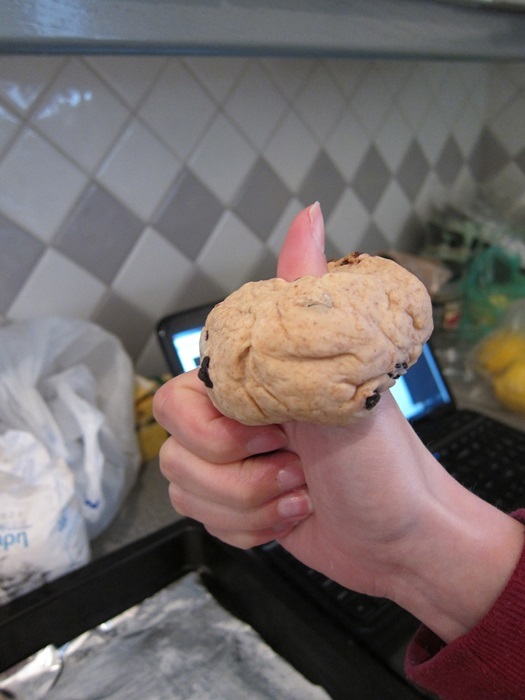 Starting by working your thumb through the balls, one at a time, form them into a bagel shape. Try to keep them evenly thick all the way around, so that they cook evenly. Place them on a baking sheet. Brush the tops with oil, cover, and let rise another 30 minutes. Towards the end of that time, get a large pot of water boiling and preheat your oven to 200c (390f). Add 1 tablespoon of sugar for each liter of water in your pot. 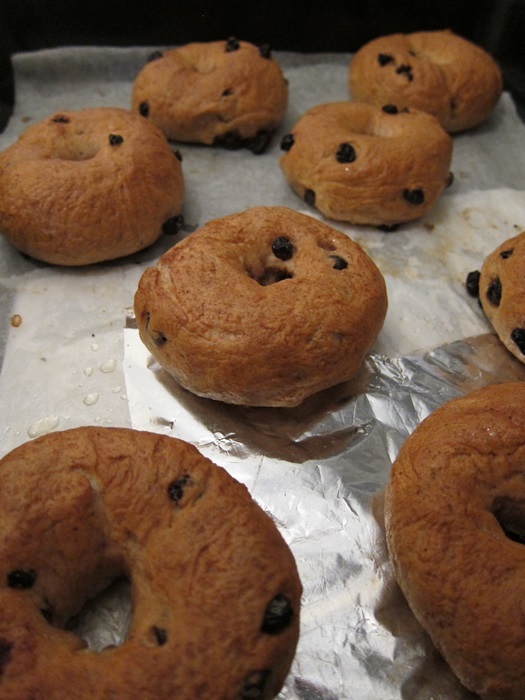 Place as many bagels in the water as can fit without touching, and boil them for about 1 minute per side. 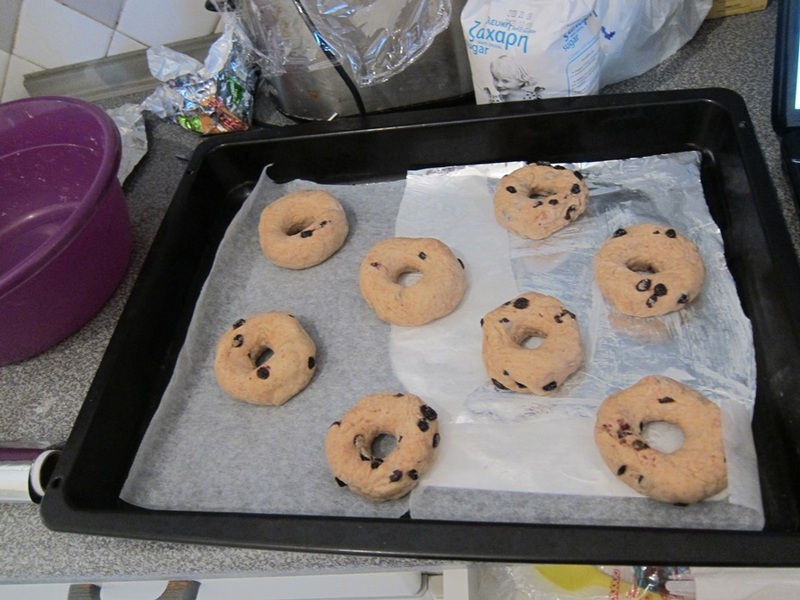 Place the boiled bagels back on your baking sheet, and boil the remaining bagels. Brush the surface with egg white, using that to attach seeds, if desired. Bake 25-30 minutes, then enjoy. This entry was posted in Bread, Breakfast, Brunch and tagged bagels. Bookmark the permalink. 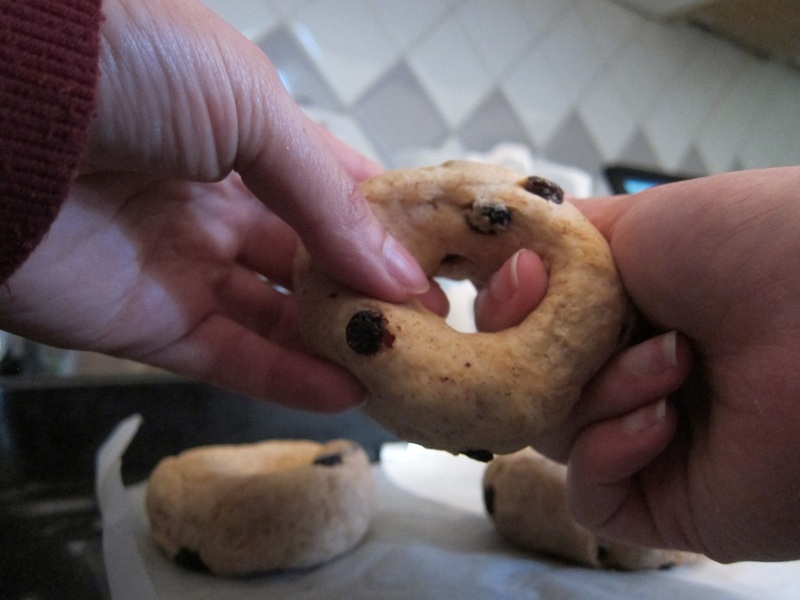 Okay, so why on earth are GF bagels so hard? I mean, shouldn’t a good flour blend and xanthan work in place of the regular flour? I am so going to try this again. I want BAGELS! 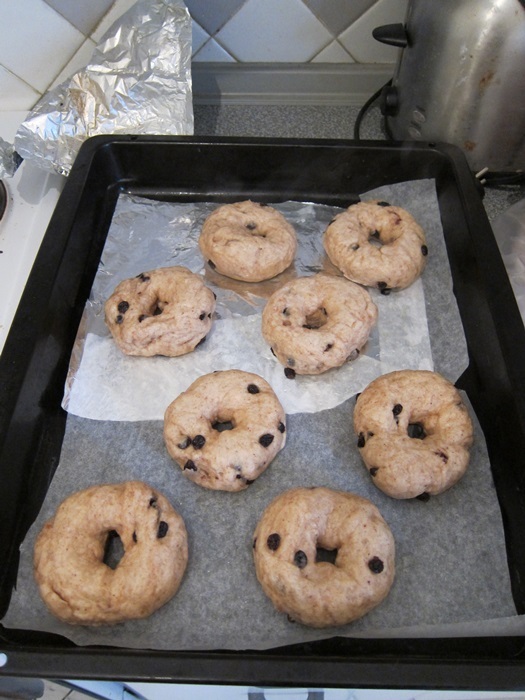 I haven’t made a ton of gf doughs that felt like they could stand up to the boiling step? Mostly…gloops.